If this is a retrace before a bullish explosion, I don’t know. What is clear for sure is that EOS, Tron and a host of other cryptos under our radar are reversing their two or three days gain. 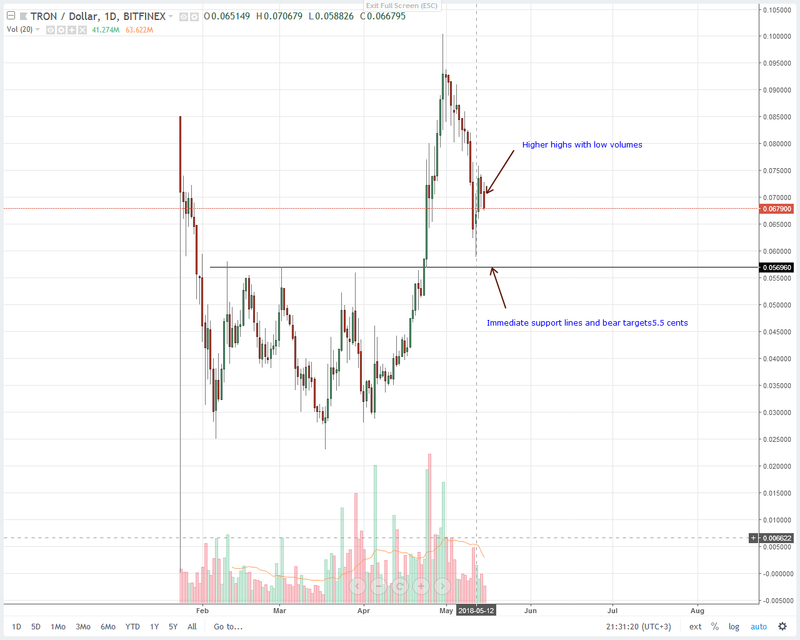 Spearheading this depreciation is EOS which is down eight percent in the last 24 hours and quickly approaching our main support line at $13. I mean, with a market capitalization of $15 billion, stakes are high for EOSIO and its co-founder. As we near the launch, investors expect nothing short of success. After all, we might take confidence from Block.One VC partnership and the more than “100” startups that will launch their projects on the new super fast and “near free” EOSIO blockchain. 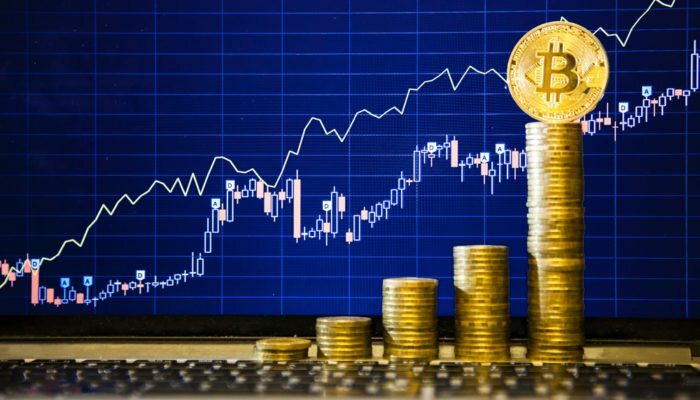 Demand is there yes and the right thing to do by all accounts is to search for coin under-valuation before riding with the trend-at the right times. Regardless of the positive sentiment, May 11 candlestick is of significance in our analysis. Then again, in the short term-following EOS ATHs print on April 29, bears are obviously in charge. In line with our previous trade plan, buyers should remain neutral until we see an up-thrust accompanied by strong volumes past $16. 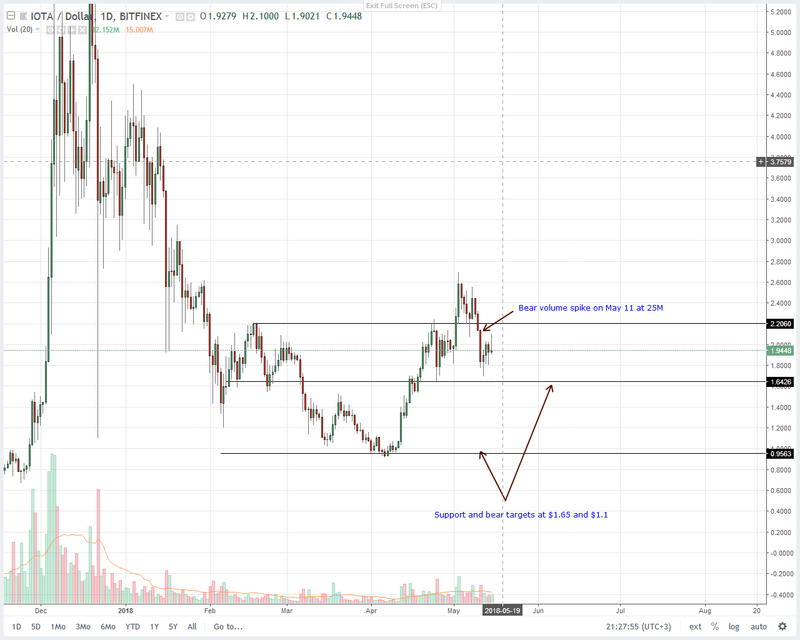 Otherwise, consistent EOS sellers might push prices back to our first potential reaction point at $13 and later $9.7 as visible in the daily chart. Among other coins, Litecoin is one of the coins under monitor from CCID and published in their monthly Global Public Chain Assessment Index. There are several criteria that the Chinese department shall use to generate reports. This is surely good news and some sort of endorsement for Charlie Lee and Litecoin. 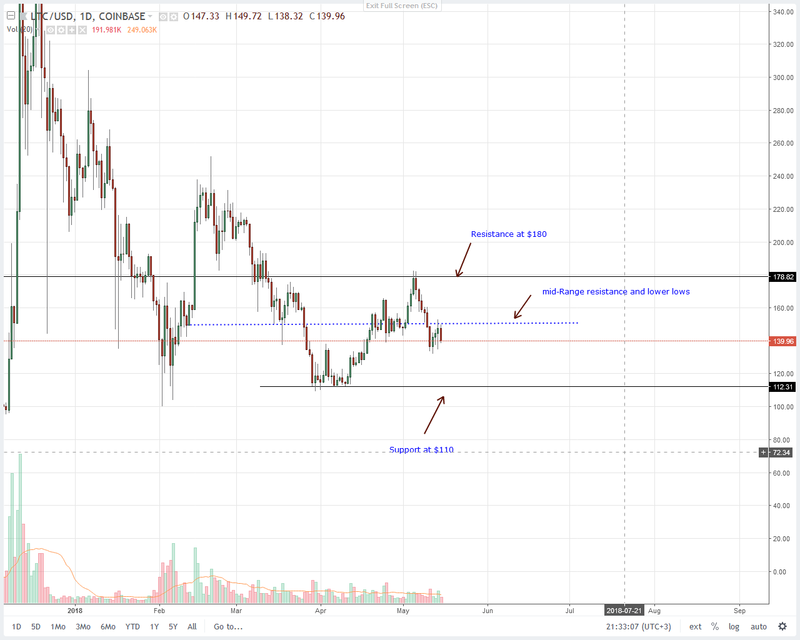 Technically, Litecoin is ranging and oscillating between a $70 range defined by $180 and main support at $110. Well, it’s obvious that sellers are in charge considering those series of lower lows in the last four months or so. While fundamentals over the past week have been encouraging, there is no impetus to push prices past the mid range resistance at $160. This means the last four candlesticks are short covering events and as such, every high is a selling opportunity as yesterday’s four percent slide and bear candlestick shows. I recommend trading with the trend today and selling with stops at $155 and targets at $110 looks good. 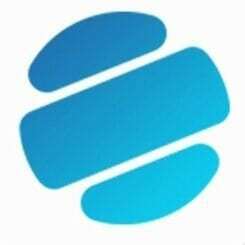 Even as we continue to rock back and forth, we haven’t heard much from Stellar Lumens in the last couple of weeks despite it being a high liquid coin with a market cap of $6.5 billion. Should those be red flags? Or is there something happening behind the scene? Well, what we do know is that Stellar is down five percent in the last week and four percent in the last 24 hours alone. From the charts, Sellers are in charge just like most coins under our radar. 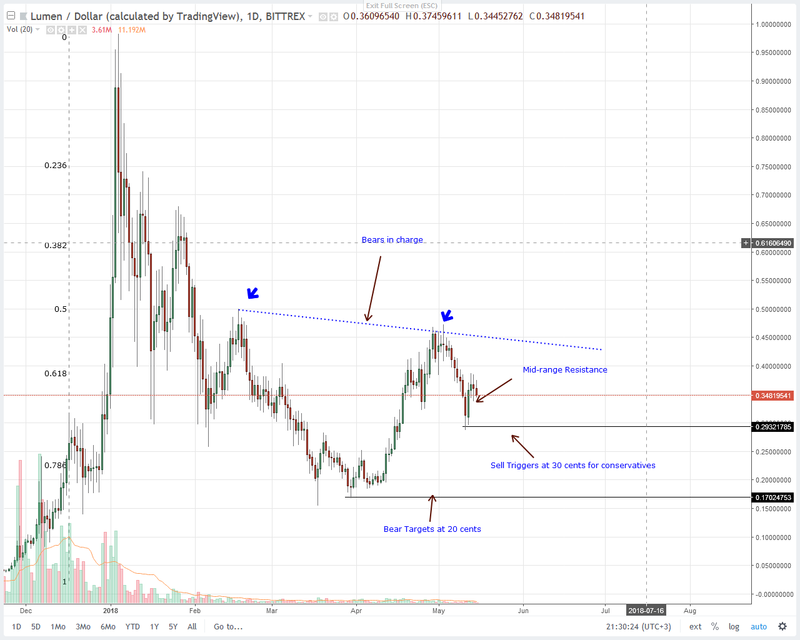 We can see a brief appreciation in Stellar Lumens prices but the accompanying volumes are low. On May 14 for example, there was a surge in volumes but prices moved lower with yesterday being a follow through. Because of this, trading with the trend can increase our odds of turning in a profit. Risk averse traders shall trade when there is a break below 30 cents while others can sell now with stops at 40 cents. Targets should be at 20 cents. 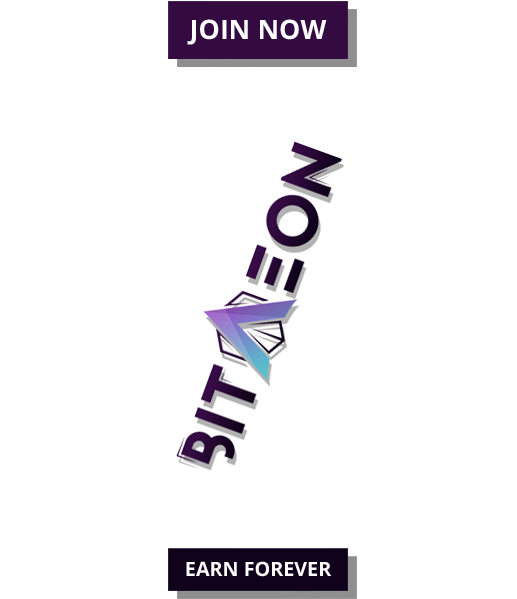 The cool thing that should excite Tron investors is that BitBNS, an Indian Cryptocurrency exchange shall support EOS and Tron mainnet launch. This is nice as both blockchains seek to gain independence from Ethereum. It is quickly turning out that May 12 and 13 candlesticks were short coverings considering the appreciation without sufficient below average volumes in those two days of hope. Simply following the trend in this case can be profitable and in line with yesterday’s trade plan, our sell triggers lies at 6.5 cents or May 13 lows. Thereafter, targets of 5.5 cents and stops at 7.2 cents look reasonable. After Michel and Andrew, Andrea Villa is now a member of the IOTA Foundation. Andrea is an IT security expert, a hacker, entrepreneur and a developer. 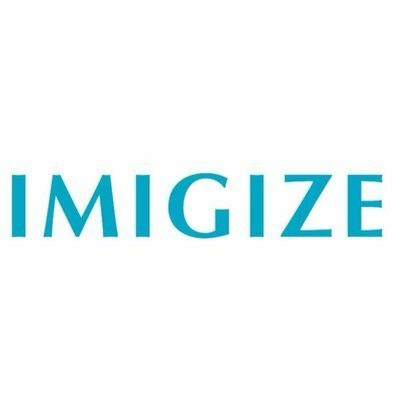 His expertise would be needed to secure the Tangle protocol and other security layers that the IoT leader depends on. 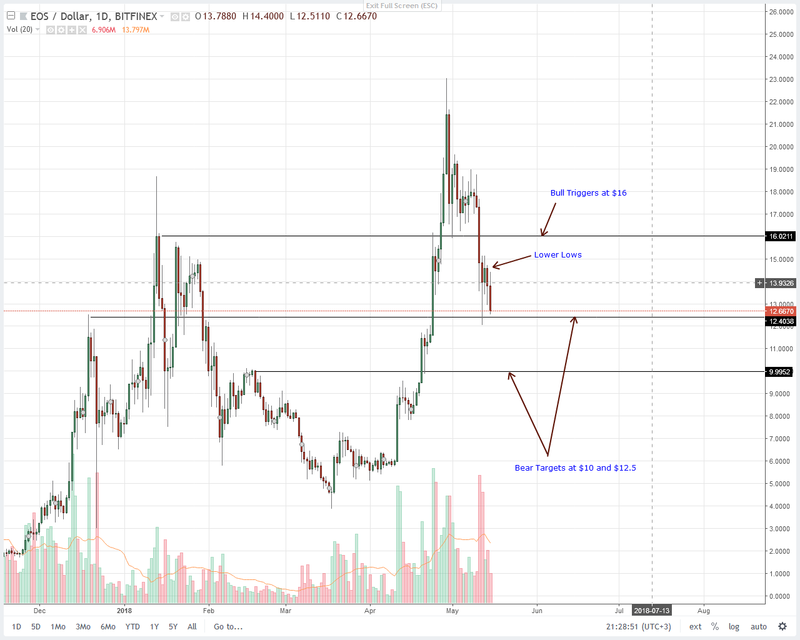 Now, IOTA is likely to deep if May 11 lead bear candlestick shall define price action. From the chart it is clear that its high low at 2.14 and 1.77 largely define range in the last four days. What is of importance to me is that supply spike which was well over 25M pushing prices lower. The best approach now is to sell IOTA and aim for $1.5 and $1.1 in the short to medium term in line with the existing bear trend. If not, then up thrust and rejection of lower lows above $2.2 shall signal bulls.